Did you see the last Indie movie – Indiana Jones and the Kingdom of the Crystal Skull? 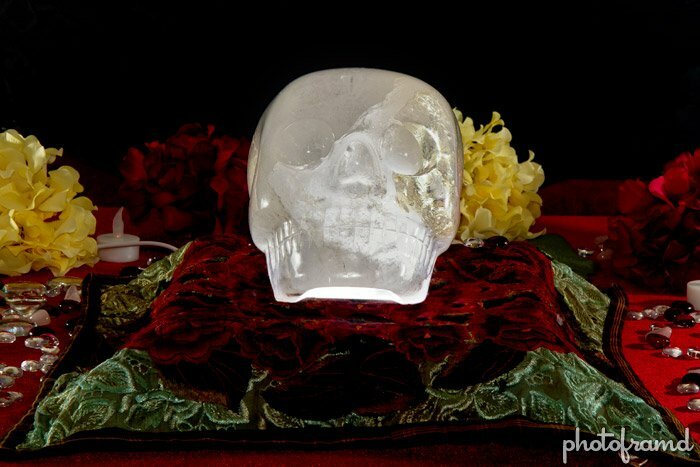 Did you know that there really are crystal skulls? Time to meet MAX! A couple of weeks ago, I was bored flipping through channels and stopped on an Ancient Aliens marathon on H2. 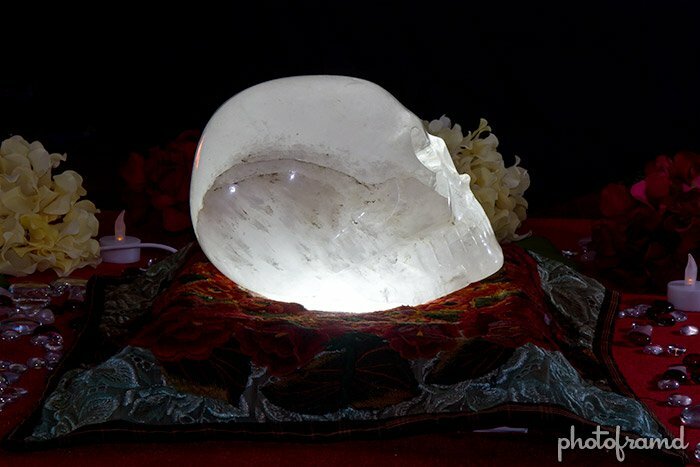 It was in the middle of the episode called “The Mission” and featured real crystal skulls which have been discovered around the world. One of the featured skulls was called Max. 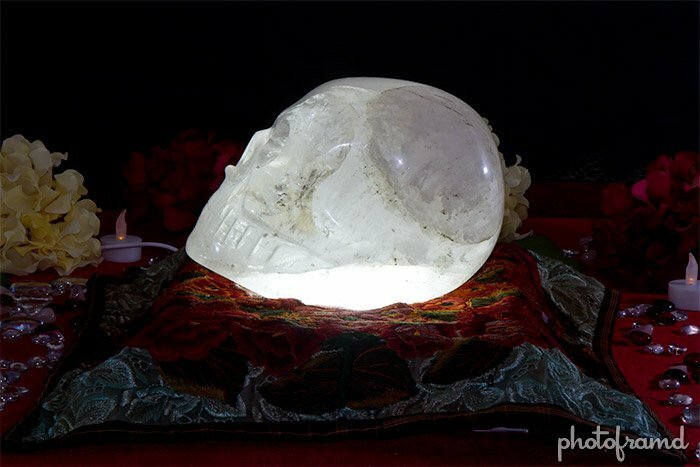 Later in the week, I saw an article that Max the Crystal Skull was going to be on Long Island. Coincidence?? How could I pass this up? I booked a session with Max and took a series of photos. The above shot is an HDR composite of three photos. Max was seated on a small lightbox with and embroidered cover. Glowing skull, dark background … hmmmm. I used two Canon 580 EX IIs, one on each side. Using the wireless trigger in the Canon 7D, I shot a series in Bulb mode combining the flash along with the extended exposure of varying seconds with an f/22 aperture. Max recommended using 7-seconds, so I tried it. The HDR composite produced plenty of detail. Take a look at the close-up below. 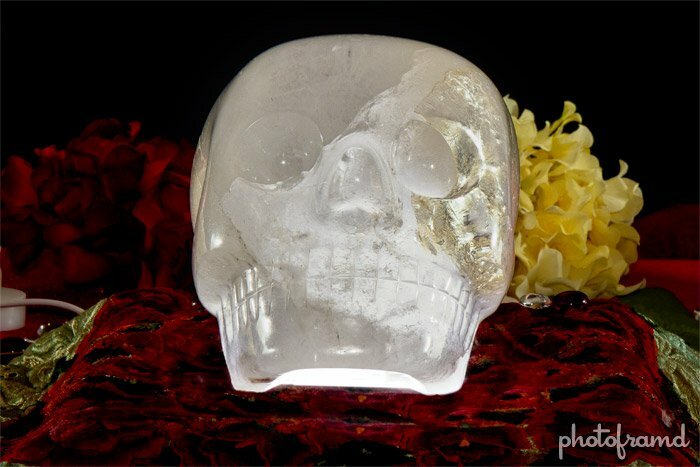 Max is made of an exquisite translucent quartz. The left side has a visible gold tone. But, you really need to see Max in person. Max is life-size, almost 20-pounds and the detail in the carving is amazing. Here are some non-HDR side shots. Max’s caretaker is Joann Parks, a Texan with a personality as big as Max. Max was stuck in Joann’s closet for a number of years until he told her that he wanted out of the closet. Soon after, he told her that his name was Max. You can read her story here. I will share something interesting that happened during my shoot. 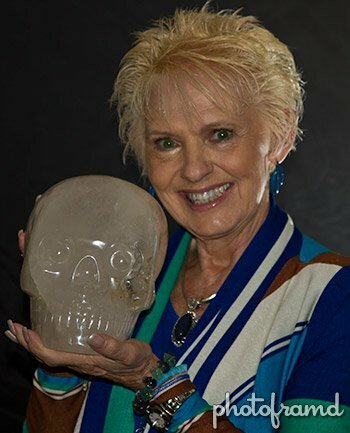 Towards the end, I placed a miniature quartz skull next to Max. After one shot, the flash on that side stopped working. My Canon 7D was on a tripod and did not move. The only change was adding the little skull. I turned the flash off and then back on to reset it. After one shot, it stopped working again. I tried resetting it again, but it lasted for only one shot and then stopped flashing. Up until this time, I was using both flashes without a problem. All flashes had brand-new lithium batteries and were in use for only 25-minutes.